All aboard for Ticket to Ride Rails & Sails! 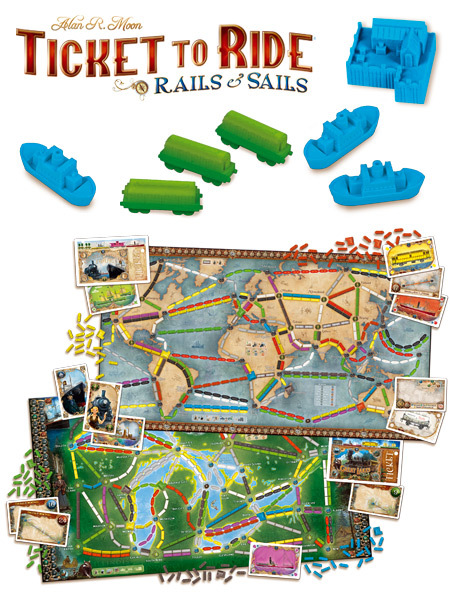 Discover the next installment in our famous train game series: Ticket to Ride: Rails & Sails! Including a massive two-sided board featuring the World map on one side and the Great Lakes of North America map on the other, this version will enable you to set sails to new horizons thanks to the new ship routes. With the new Train and Ship cards, you will be able to claim the routes on the map, and also use them to build harbors and maximize your score. Double-Ship cards are included to quickly cross seas and lakes. Last, but not least, a new type of ticket appears: the Tour tickets, listing between three and five cities, that must be connected together at all costs, and rewarded with many victory points. 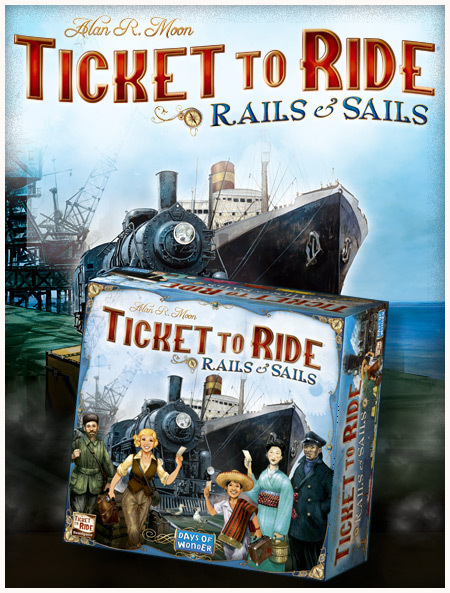 Ticket to Ride: Rails & Sails is for 2 to 5 players ages 10 and older and takes approximately 90-120 minutes to play. It is a stand-alone game in the Ticket to Ride series. It includes 1 Double-Sided Board featuring 2 Maps: the World and the Great Lakes of North America. It also includes 165 Plastic Trains, 250 Plastic Ships, 15 Harbors, 5 Scoring Markers, 140 Travel Cards (Train, Ship, Double Ship and Wild) and 120 Ticket Cards (65 for the World map and 55 for the Great Lakes map). Ticket to Ride: Rails & Sails is expected to be available at GenCon in August, then worldwide in early September at an expected retail price of $80/€70. This entry was posted on Tuesday, June 21st, 2016 at 15:01 and is filed under Games, News, Ticket to Ride. You can follow any responses to this entry through the RSS 2.0 feed. Both comments and pings are currently closed. Ticket to Ride: Rails & Sails is expected to be available at GenCon in August, then worldwide in early September at an expected retail price of $80/€70. Anyway, if the print run hasn’t started, slam on the brakes and get that changed! If it has, oh well, the first edition will be a collectors edition, but it won’t sell well in Parry Sound. I hope that does get fixed. I can ignore the more common Black Bear being bumped for a Brown bear but one of the cities (‘Parry Sound’) being misspelled is bad editing. Besides the map, the Destination cards should be changed/checked. I’d like to know if the previous map packs will be reprinted. They’re getting pretty pricey now that I’m interested in buying them.